city. The lives of thousands of people are in your hands, and you must act immediately. Inside the circle you will find two cans. The unsafe can is about half full of the toxic popcorn. The safe can is to be used to neutralize the toxic popcorn. the materials provided to you. No participant may cross the plane of the circle with any part of the body. If this occurs, the person must be taken to the hospital immediately and may no longer participate. One member (the EMT) of the group is responsible for the safety of all members and watches to make certain no one enters the circle. If a member crosses the line, the EMT must remove that member from the group. No participant may sacrifice himself or herself to aid in the transfer of popcorn. If any popcorn spills, it will explode, and the mission has failed. Participants may only use the materials provided. However, they can be used in any way desired. The popcorn will not spread its toxicity to the safe can, the ropes, or the tube. 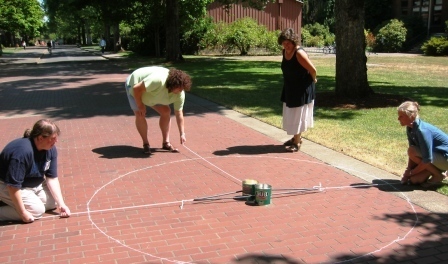 The participants have no protection inside the imaginary cylinder created by the 10-foot diameter circle. The safe container may move anywhere in or outside of the circle. The unsafe container must stay inside the circle and may not be moved more than one foot from the center of the circle. Remember, the popcorn must be transferred within 30 minutes, or there will be a tremendous disaster. Give the group some planning time with no action e.g. 5 mins, then start the clock and indicate its time for action, e.g., 15 or 20 mins. If someone breaches the toxic waste zone, indicated by the circle, enforce an appropriate penalty e.g., loss of limbs (hand behind back) or function (e.g., blindfolds if a head enters the zone) that lasts for the rest of the game. If a whole person enters the zone, they die and must then sit out for the rest of the activity. 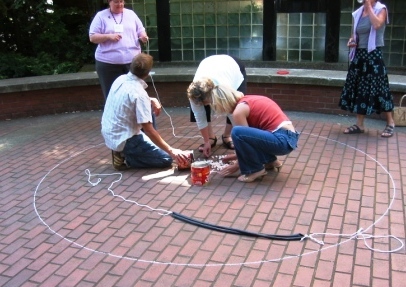 If the group struggles to work out what to do, freeze the action and help them discuss. If the group spills the waste entirely, make a big deal about catastrophic failure (everyone dies), invite them to discuss what went wrong and how they can do better, then refill the container and let them have another go. What reactions did you have when you realized your importance to the overall team? What was the impact of having team members available (and willing) to help you? What impact did the time deadline have on your effectiveness? What was the initial reaction of the group? What skills did it take for the group to be successful? What would an outside observer have seen as the strengths and weaknesses of the group? How did the group come up with its best ideas? What did each group member learn about him/her self as a group member? What lessons did the group learn from this exercise which could be applied to future situations? Object Retrieval is a variation in which a group needs to retrieve a heavy object from the middle of a circle, without touching the ground in the surrounding circle (Rohnke, 1994). Divide the group into leaders and workers. Leaders can talk but not touch equipment. Workers cannot talk but can touch equipment.